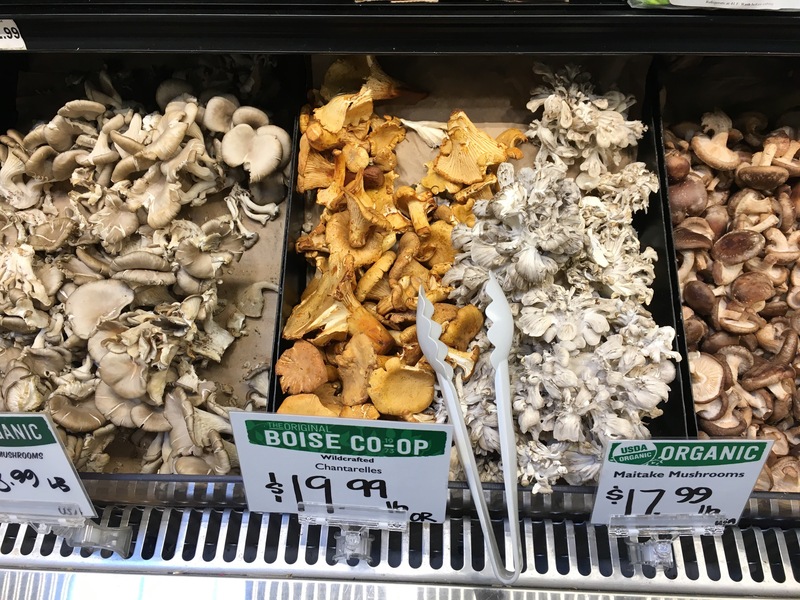 A quick post about my latest grocery shopping and a few snapshots of the bulk options at the store. 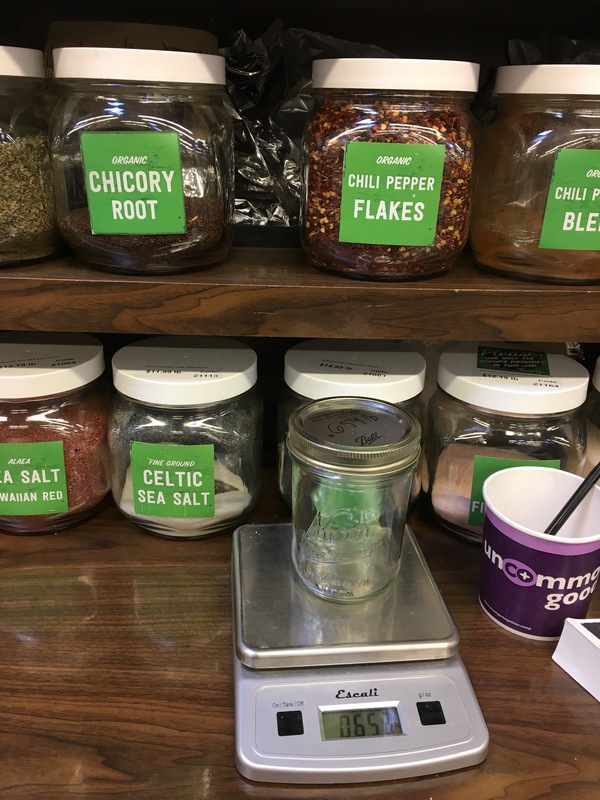 Coffee ground at the store, buckwheat flour, freshly ground peanut butter, milk, bulk eggs, chanterelle mushrooms, lemongrass, figs, two vegan mushroom bahn mi sandwiches, pretzels, and romanesco cauliflower. All was bought at the co-op nearby. Buckwheat for making soba noodles, chanterelles will accompany the noodles, lemongrass for making curry paste, cauliflower got thrown into dahl. I get seriously excited when I find cauliflower sans plastic wrap and this one is extra enticing! Everything else was typical groceries or was consumed within a day or two. 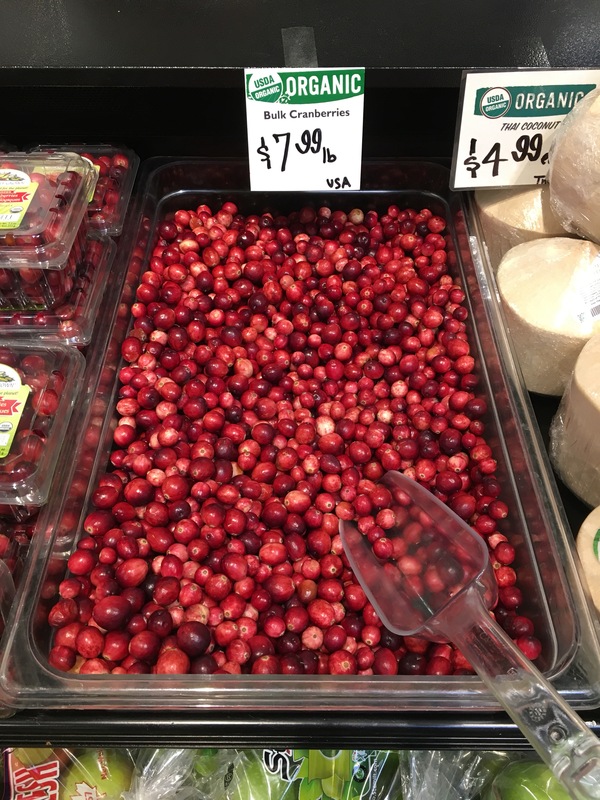 I didn’t purchase any cranberries, but they did look tempting! Maybe next time when I have a plan for them. Weighing my jar before I put anything in it and a peek at ALL THOSE SPICES! 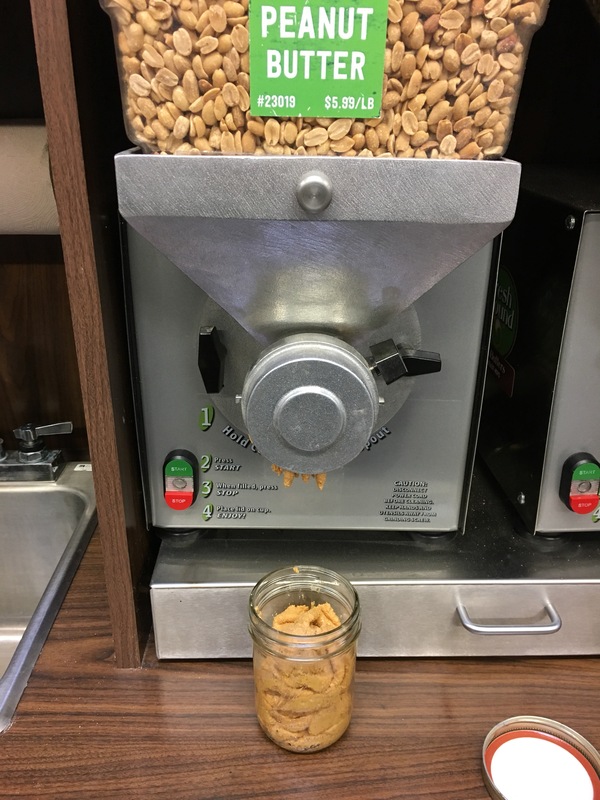 I decided peanut butter needed to go in my jar. 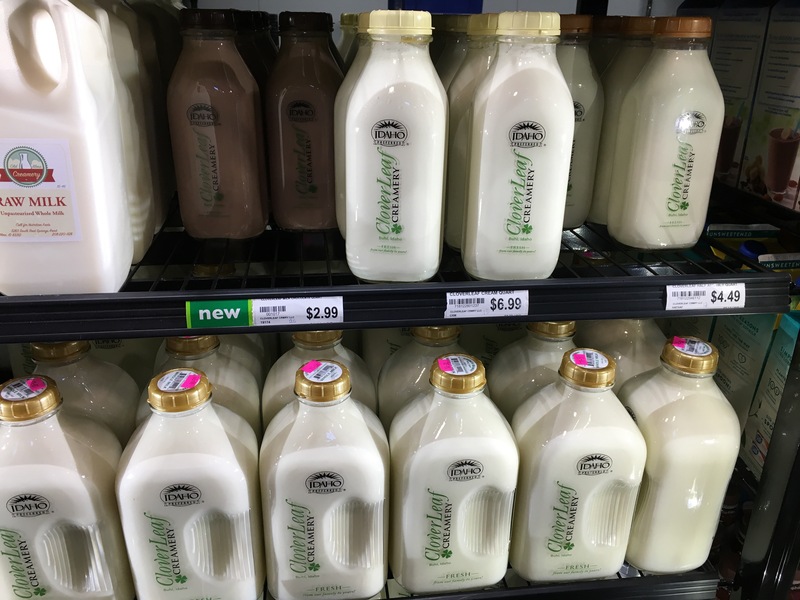 Many milk options if you’re into that. I appreciate the half & half for my coffee and milk for English muffin making. 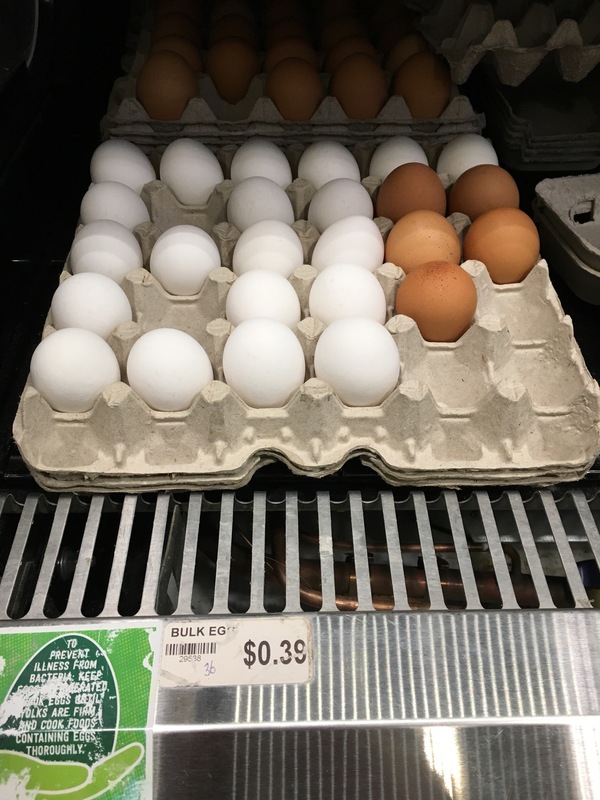 Bulk eggs = not too expensive. There were many more bulk options I didn’t get photos of because I’m shy. I feel extremely fortunate to be able to get as much as I do package free and even organic and local. This is the way I do it, and I’d love to hear how anyone else makes it work or your personal struggles or frustrations with package free grocery shopping.